Black Lung Study Finds Biggest Cluster Ever Of Fatal Coal Miners' Disease The cluster, found in central Appalachia and first reported by NPR, indicates that a disease once thought to be on the decline is still a common killer among coal miners. In this historical image, a doctor reviews an X-ray of a patient with black lung disease. Federal researchers say they've now identified the largest cluster ever recorded of the most advanced stage of the disease. In a research letter published Tuesday in the Journal of the American Medical Association, NIOSH confirms 416 cases of progressive massive fibrosis or complicated black lung in three clinics in central Appalachia from 2013 to 2017. "This is the largest cluster of progressive massive fibrosis ever reported in the scientific literature," says Scott Laney, a NIOSH epidemiologist involved in the study. "We've gone from having nearly eradicated PMF in the mid-1990s to the highest concentration of cases that anyone has ever seen," he said. 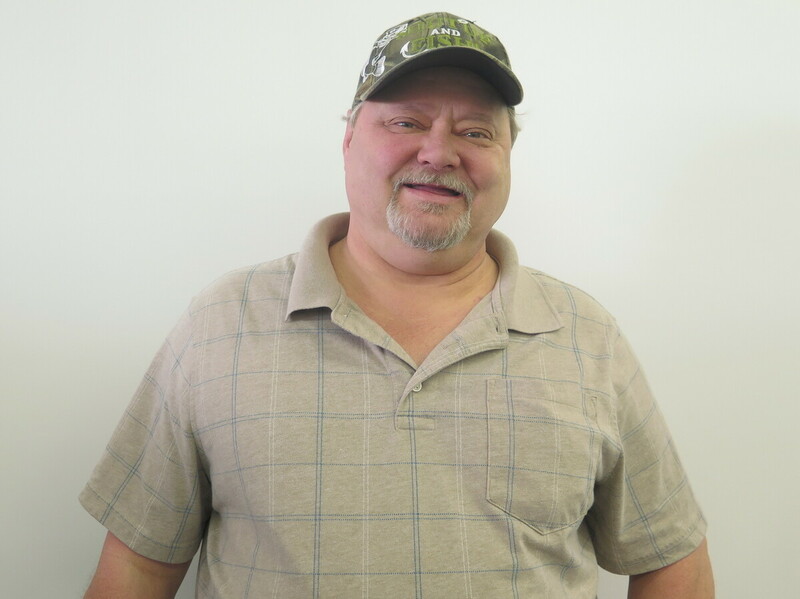 The clinics are operated by Stone Mountain Health Services and assess and treat coal miners mostly from Virginia, Kentucky and West Virginia, a region that includes what have historically been some of the most productive coalfields in the country. "When I first implemented this clinic back in 1990, you would see ... five [to] seven ... PMF cases" a year, says Ron Carson, who directs Stone Mountain's black lung program. The clinics now see that many cases every two weeks, he says, and have had 154 new diagnoses of PMF since the fieldwork for the NIOSH study concluded a year ago. "That's an indication that it's not slowing down," Carson says. "We are seeing something that we haven't seen before." A slide from a presentation by the National Institute for Occupational Safety and Health shows the progression from a healthy lung to advanced black lung disease. Laney acknowledges that the full scope of what he calls an epidemic is still unknown. "Even with this number, which is substantial and unacceptable, it's still an underestimate." 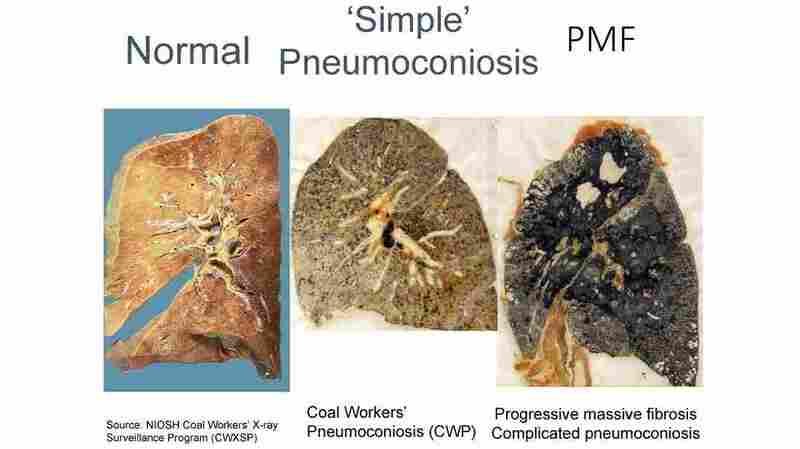 "Nobody looks forward to dying"
PMF, or complicated black lung, encompasses the worst stages of the disease, which is caused by inhalation of coal and silica dust at both underground and surface coal mines. Miners gradually lose the ability to breathe, as they wheeze and gasp for air. 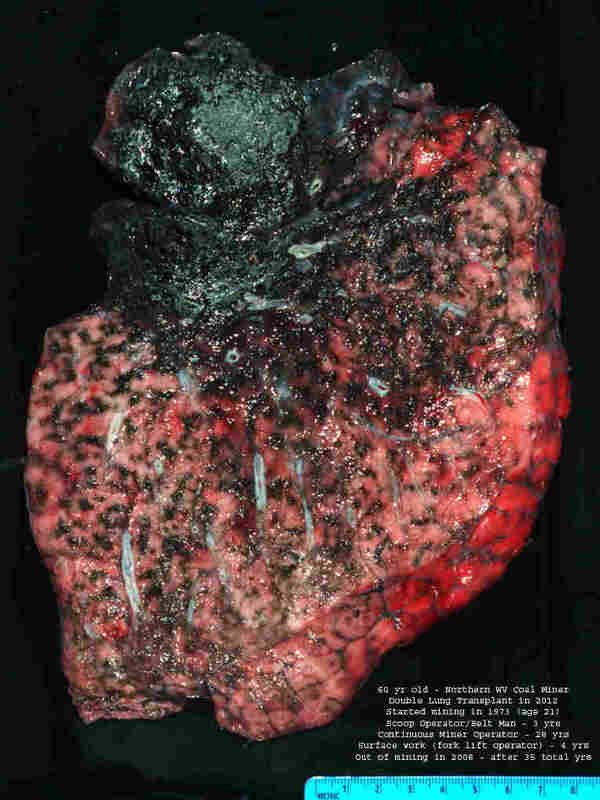 Edward Brown is a 55-year-old former coal miner with progressive massive fibrosis, or complicated black lung disease. "I've seen it too many times," said Charles Wayne Stanley, a Stone Mountain client with PMF, who spoke with NPR in 2016. "My wife's grandpa ... [I] watched him take his last breath. I watched my uncle die with black lung. You literally suffocate because you can't get enough air." Lung transplants are the only cure, and they're possible only when miners are healthy enough to qualify. "[I] can't breathe, you know. [I] can't do nothing hardly like I used to," says Edward Brown, a 55-year-old retired miner from Harlan, Ky., who was diagnosed with PMF at both Stone Mountain and another medical clinic. "That's all I got to look forward to is to get worser and worser," Brown says, pausing for a deep sigh and nervous chuckle. "Nobody looks forward to dying, you know, but it's a-comin' and then that worries me." Brown's age and disease fit another finding of the NIOSH study and a trend Carson first disclosed to NPR in December 2016. "Miners are dying at a much younger age," he says, noting that in the 1990s, the clinic's PMF diagnoses typically involved miners in their 60s, 70s and 80s. Now the disease strikes miners in their 50s, 40s and even 30s with fewer years mining coal. "A high proportion" of the miners in the NIOSH study had severely advanced disease and "coal mining tenure of less than 20 years, which are indications of exceptionally severe and rapidly progressive disease," the study says. 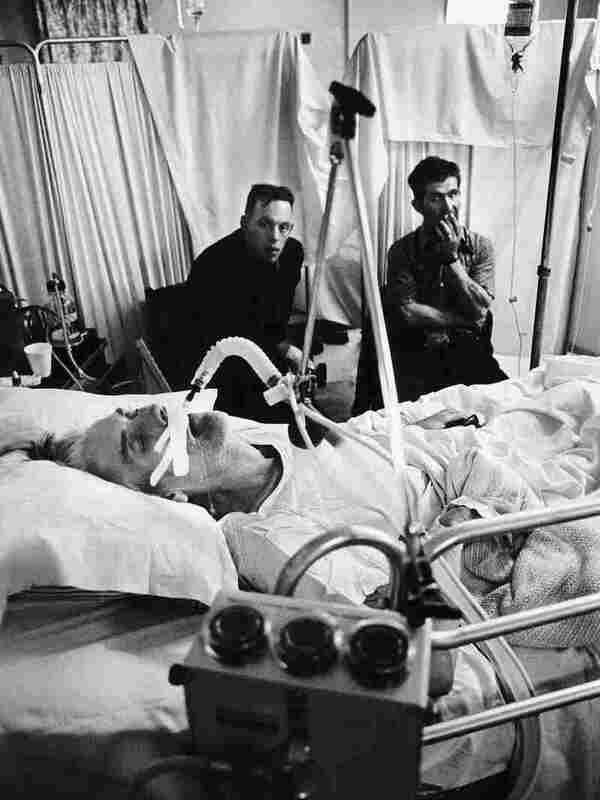 The lung of deceased West Virginia coal miner Chester Fike was taken out during a double lung transplant when he was 60. He worked in the mines for 35 years. The Stone Mountain study follows a NIOSH review of cases at a small clinic in Coal Run Village, Ky., in 2016. NIOSH researchers confirmed 60 diagnoses of PMF there in 20 months. That alarmed them because NIOSH had earlier reported only 99 cases nationwide in five years. At the same time, an NPR survey of 11 black lung clinics in Kentucky, Virginia, Pennsylvania and Ohio identified 962 cases, 10 times the original NIOSH count. Since then, NPR's ongoing survey of clinics has counted nearly 1,000 more cases. The NPR investigation also found that the likely cause of the epidemic is longer work shifts for miners and the mining of thinner coal seams. Massive mining machines must cut rock with coal and the resulting dust contains silica, which is far more toxic than coal dust. The spike in PMF diagnoses is also due to layoffs and retirements brought on by the decline in coal mining. 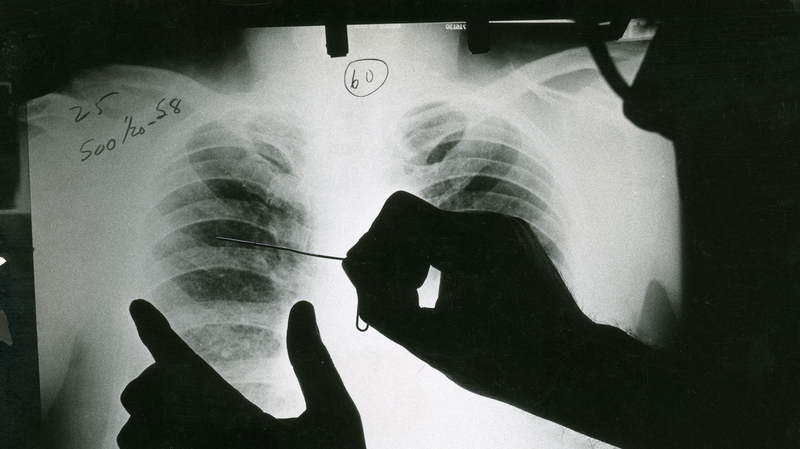 Miners who had put off getting checked for black lung earlier began streaming into clinics, especially if they needed the medical and wage replacement benefits provided by black lung compensation programs. There is also concern for the 50,000 coal miners still working. "They really need to declare this a public health emergency," says Joe Wolfe, an attorney in Norton, Va., who helps miners file claims for black lung compensation. "If you had 400 cases of E. coli, [NIOSH] would flood the area with technicians and doctors and nurses checking people's health," Wolfe adds. "There are people literally working in the mines right now ... that have complicated black lung that do not have a clue." NIOSH doesn't have that authority, according to David Weissman, who directs the agency's respiratory health program in Morgantown, W.Va. Public health emergencies are declared by the secretary of the U.S. Department of Health and Human Services. "But I will say that this is a very important problem. We're very passionate about this problem," Weissman says. "And we're going to keep doing everything in our power to address it." Multiple NIOSH and independent studies are underway or planned to try to pinpoint the number of miners who have the disease, as well as the causes. Jess Bishop, a black lung victim, takes his last breaths while his sons — also coal miners — keep vigil in Logan County, W.Va., in 1976. The disease spiked in the 1960s and '70s but then plummeted with the passage of mine safety laws. Coincidentally, new federal regulations that are supposed to limit exposure to dangerous levels of coal and silica dust were fully implemented in 2016, a few months before NPR first reported the PMF epidemic. The Trump administration recently announced a "retrospective study" of the new regulations, a move that has mine safety advocates concerned, especially given the epidemic of the disease caused by mine dust. "It would be outrageous for any undercutting of those regulations that puts miners [back] in harm's way and subjects even more of them to this terrible disease," says Joe Main, the former mine safety chief at the federal Mine Safety and Health Administration. "When we think we know as much as we thought we should know about the disease, the next day [there's] worse information," says Main. "It shows that the depth of the disease is worse than what we knew the day before." Main pushed for the tougher mine dust exposure limits. His successor at MSHA is David Zatezalo, a former mining company executive. "We are not proposing to weaken this rule," Zatezalo tells NPR in a written statement. "We are planning to collect feedback on the rule from stakeholders, which was both a commitment previously made by MSHA, and a directive from President Trump, who strongly supports America's miners." Zatezalo did not respond to requests for an interview. His agency's formal notice for the "retrospective study" labels it a "deregulatory" action, which implies less regulation. 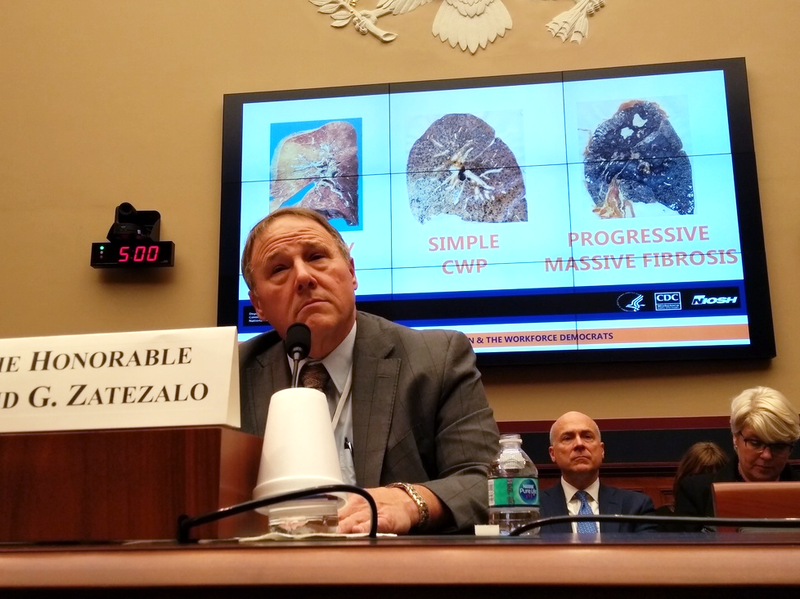 At a congressional hearing today in Washington, Zatezalo was asked directly about his agency's "retrospective study" of the tougher mine dust limits imposed by the Obama administration. "Do you plan to rollback any aspect of the 2014 respirable dust rule?" asked Rep. Bobby Scott, D-Va., the ranking Democrat on the House Committee on Education and the Workforce. David Zatezalo, the Assistant Secretary of Labor for Mine Safety and Health, was asked about the advanced black lung epidemic at a congressional hearing in Washington, D.C., on Feb. 6, 2018. "I do not," Zatezalo responded. Zatezalo was also asked about his agency's own description of the "retrospective study" of the new mine dust regulations as "deregulatory." "I can't tell you why it was listed as a deregulatory item," Zatezalo responded, unless, he added, that had something to do with the frequency of testing using new dust monitors. "Each case of advanced black lung disease is an entirely preventable tragedy, and represents mine operators' unwillingness to adequately control mine dust exposures, and safety regulators failure to set, monitor and enforce standards necessary to protect miners," Scott said in a statement to NPR. "MSHA should not bend to pressure from well-connected coal mine executives to roll back the regulations," Scott added. "The Mine Safety and Health Administration (MSHA) cannot keep looking the other way while the burden of this preventable disease grows." The burden is clear on the walls of Ron Carson's office at the Stone Mountain black lung clinic in St. Charles, Va. They're lined with photographs and other mementos of clinic patients, some who died from the disease. Carson describes a kind of mining disaster in slow motion, in which the disease takes years to develop, even though it strikes quicker now, and in which each death is solitary. He points to a half sheet of white paper tacked to his bulletin board. It shows a phrase he printed out from an article about black lung.